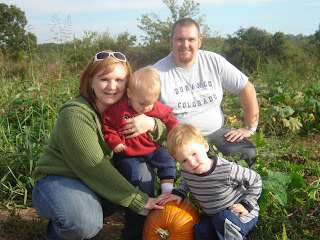 We had a great day at the Pumpkin Patch a week or so ago. 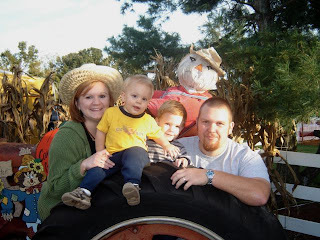 Nathan enjoyed the hay ride and Micah was sick. Poor guy! It was actually Micah's 1st birthday. I'll post some pictures of that soon. I need to get them off my camera and we just haven't had a moment to sit and really play catch up. But I want to do a good post of how my sweet Micah's first birthday celebration was for us. Please keep us in your prayers. We fly back home to Austria 4 weeks from today and we are so very excited. We've thoroughly enjoyed our families and friends but it's time to get back to our life in Austria. It's a blessing to have the friends we've made since arriving there 3 years ago write us and tell us to 'Come Home! '.